Diesel engine driven generators have a running speed in the range of 187rpm to 1800rpm. In case of diesel engine generators, the reciprocating engine transfers very high cyclic loads to the generator resulting in high vibrations. These vibrations are required to be effectively absorbed by the generator, which further requires special designs for rotor dynamics and specialized stator parts. 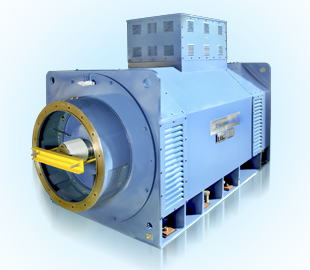 We undertake special torsional studies to ensure that the generator operating frequency does not match with any other system frequency thereby avoiding high stresses to the machinery. Diesel engine generators are used for peak load demands and also find wide application in critical installations like emergency/back up power plants in hospitals, airports and manufacturing plants involving critical processes. Our generators have been procured by set builders for installation across various industries such as international airports and satellite research centers, data server farms and process industries. We manufacture generators with output range up to 20 MW. Our generators are coupled with all major international engine brands. Sturdy design suitable for severe environment.